Please use the buttons at the left to explore my website. 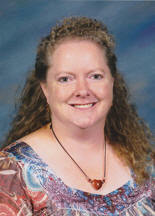 This will be my 15th year teaching Ancient History and Art and my 4th year teaching Geography at Canton Middle School. Mesopotamia is the land between two rivers, the Tigris and the Euphrates. While studying Egypt, we will learn about mummies, pyramids, and many other things. While studying China, we will learn about the Great Wall, acupuncture, Confucius and many other things. The democracy of the United States is closely related to that of Ancient Greece. They also gave us the Olympics. Ancient Romans could build arches out of stone with out using any mortar! We will learn about the Aztec's, Incan's and Mayan's way of life. The Mayas believed that humans must be killed so that the gods would send rain. The middle ages began with the fall of Rome and ended with Christopher Columbus landing in the Americas. This year will be very busy for you, but trust me, you'll learn so many neat things by the end of the year! These are some of the projects we will do in art this quarter. Compass Art - Students use a compass to create a variety of beautiful designs. Circles and Arcs - Students use the designs they learned from last project to create a watercolor collage. 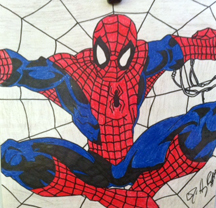 Cartoon Enlargement - Students will use grids to enlarge a cartoon into a 12x12 picture. 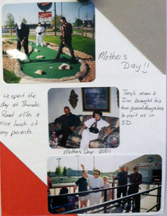 Scrapbooking - Students will need a minumin of 5 pictures that they can cut up and glue down in a scrapbook. Poster - Students will research a topic they chose by finding two pictures and three facts and create a poster with a centered title.